MDF Panels, MDF Sheets, MDF Skirting - Large Stocks. We stock a wide selection of MDF for a variety of uses - MDF Panels, MDF Sheets, MDF Skirting, Coloured MDF and many more. MDF has developed from basic beginnings and has now evolved into a varied and very useful product range. MDF (Medium Density Fiberboard) is available is variety of sheet type, size, thickness and specification means that there are few requirements in furniture, interior & exterior design that MDF cannot fulfill, it a very versatile product. We offer a quality cutting to size service using modern planning & optimizing software, "State of the Art" Beam Saw cutting and if required quality "Hot Melt" edge banding. Let us take the strain out of accurate component production with our fork lift handling, power loading to saw, high quality precision cutting and efficient dust extraction. Avon Plywood can provide the accurately cut and edged panels you need without the manual handling and processing issues associated with cutting the product yourself. The latest development and addition to the range is "Tricoya" from Medite that is now available from stock. It is designed for exterior use and classed as "Extreme Durable" with up to 50 years exterior life. Please ask for details. Primed MR MDF Skirting, Architraves, Dado & Picture Rails. Most of these boards can be supplied cut to size & finished to order with matching or contrasting edging in wood veneer, melamine or PVC edging. (MINIMUM 10mm THICKNESS FOR EDGE BANDING PROCESS). The items listed are all regular stock items but there are many more types & finishes available from manufacturers and distributors. i.e. Bridec, Egger, Finsa, Kronospan & Medite to name but a few. Please ask for details or bring in a sample and we will try to match your particular requirements. Avon Plywood Ltd can and does source alternative boards to order on a regular basis. Special finishes can be laminated or bonded onto various core boards to satisfy bespoke order requirements. There are endless possibilities when it comes to shaping these products. MDF can be cleanly cut to size and, if required, shaped on a spindle moulder or CNC Router to make complex components. These could have rebates, radiused edges, curves, bevels or drillings, lettering, pockets or cutouts. Following machining the parts can be primer painted by hand, machine or sprayed to a fine finish. 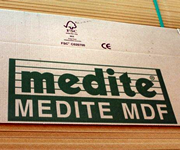 Wide range of MDF (Medium Density Fiberboard).